The GAME Group - which runs high-street stores GAME and Gamestation, as well as their online equivalents - is facing an uncertain future as a sales slump leads to a financial crisis. In its post-Christmas financial report, the company had to confess that a 17.6 per cent drop in sales for the period would mean the potential to miss its financial targets due at the end of this month. Should the targets be missed, lenders would likely review the company's credit situation in a way that would put its very future in jeopardy. When industry publication MCV reviewed the situation at the start of the year, things looked bleak: the 17.6 per cent slump for the eight-week Christmas period - traditionally one of the busiest for high-street retailers - is at the head of an overall 11.9 per cent drop in sales for the year so far. Things look significantly more bleak than Shepherd has been willing to admit, however. In a post to gaming forum RLLMUK, a Gamestation store manager claims that the entire infrastructure is crumbling as the company's credit lines run dry. Additionally, MCV reports that claims of stock shortages and staff wage delays are untrue, although the company has yet to make an official statement to this end. The unrest surrounding the company has its customers antsy, however. Many are considering cancelling pre-orders for Sony's upcoming PlayStation Vita hand-held - thanks in part to a cheaper deal from online retailer Amazon - while those with gift vouchers or store credit are wondering if waiting is worth the risk. Do you think the GAME Group can survive the coming months, or are its days numbered? Share your thoughts over in the forums. A deal valued at just £1 has saved GAME Group from the financial wrecker's yard. 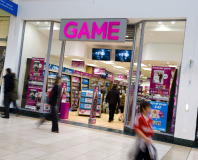 GAME Group has announced the closure of 277 stores, chiefly among its Gamestation brand. Investment led by RBS may save GAME Group, but time is running out.